QBE hosted a fantastic Match Day experience on Saturday August 6, when The Sydney Swans took on Port Adelaide Power. 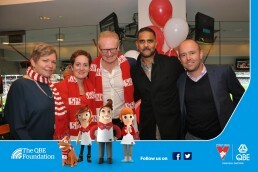 Entertainment, food, footy and fun was generously provided to Sydney Swans Charity Partners and QBE Foundation Partners, as their way of saying thanks. The GO Foundation was kindly invited as a Sydney Swans Charity Partner to join the festivities. The GO Foundation would like to thank QBE for their amazing hospitality at this event.